Braven Portable Speakers let you play music and charge your iPad! 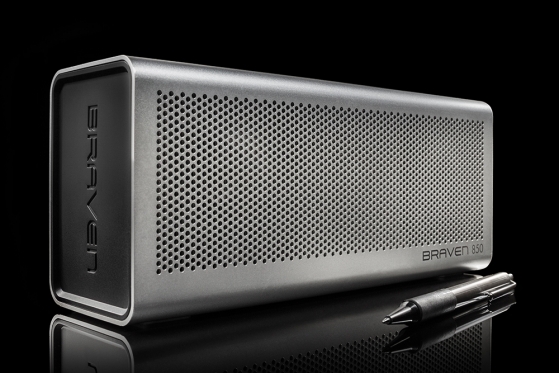 Braven, a name well known in the wireless speaker market, have just introduced their latest offering to the market. The Braven 850 and 855 are their most powerful and best sounding Bluetooth Speakers yet. Rugged, with an 8800mAh power bank, that offers 20 hours of audio, plus ability to charge any smartphone or tablet thanks to a 2.1A USB port. They also work as speakerphones, and can be wireless paired to work as stereo speakers. The 850 is the standard model, while the 855 is the rugged version, offering shockproof abilities as well as IPX certified water resistance. Previous story XBox One Available 22nd November 2013! Next story Wacom Intuos – let your creative juices flow!